Rabbi and Mrs. Yaakov Moshe Willner on the recent marriage of their daughter, Chava to Eli Barkany. Mr. and Mrs. Elliot and Amy Holtz on the engagement of their son, Adam, to Efrat Wilnai. Mr. and Mrs. Eli and Esther Press on the birth of a son. Mr. and Mrs. Marc and Kaitlyn Friedman on the birth of a son. The Shalom Zachor will be held this friday night beginning at 9:15 PM at their home, 10 Montgomery Avenue #B2 Bala Cynwyd, PA 19004. The Bris will be held bezras Hashem on monday morning, April 15 after 8:00 a.m. Shacharis at the Kollel. With the exception of Daf Yomi and Kollel Boker, allchavrusos and shiurim will not be in session. See Shabbos & Yom Tov Zemanim click on graphic above. May your generosity in helping these needy families be a zechus for you and yours to thoroughly enjoy Pesach with joy and good health! Sponsorships Available- Please see below. Please refrain from taking, texting, or emailing while in the Beis Medrash. A Beis Medrash is a makom for Torah and Tefillah. Any talking, texting, or emailing with a phone device should please be done outside the Beis Medrash. Thank you for keeping with the rules and customs of the Kollel. 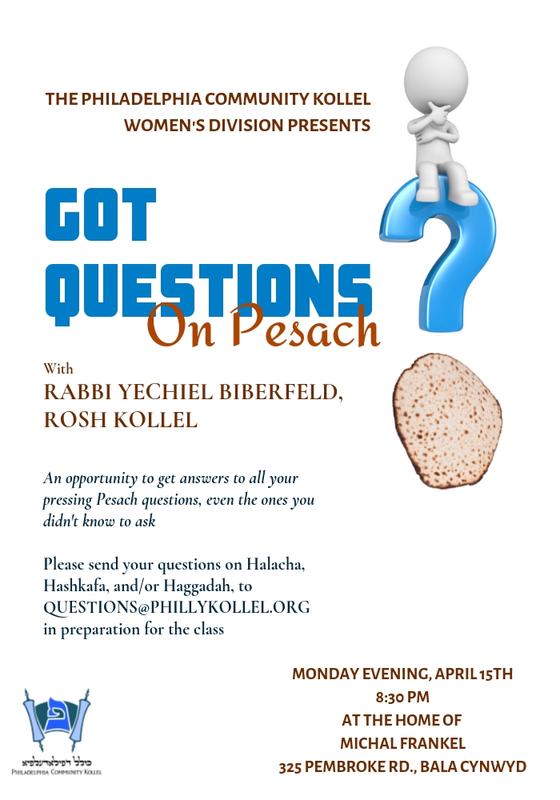 A Shiur for Women This Monday! The Kollel's secure entry system is fully operational and in order to gain access on weekdays you will need to use your fingerprint. You can sign up at the Kollel office by making an appointment. Please email office@phillykollel.org or call at 610-668-9557. There are a limited number of cards and fobs available to those who have experienced trouble with fingerprint access in the past. Please mention this before signing up. Bnos will be meeting this week from 4:30 pm - 5:30 pm at LMS. The Pirchei/Torah Youth program will not be meeting until after Pesach.